This is the best way to relax and to learn something new. Here you have your own shop. But at first you have to sell something, that is why try to fish as much as you can. Earn a lot of money and you may become the reaches person! Do you know that fishing is like a sport? 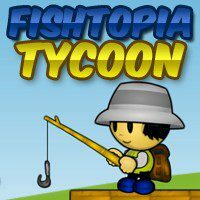 In this game you have to fish and try to sell it. In your store you can meet your visitors and customers. You have 2 big aquariums and 5 spots to build your stands. You can sell fish and get some money. You can also adjust the price and manage the stock. After you catch some fish, you can sell them here. Also, you can boost up the stock by collecting at least 2 monster fish and breed them. You can also get money from setting the ticket price. To change the ticket price, click the entrance gate. Have a fun!